"An easy, no-bake cookie recipe." Mix together sugar, butter or margarine, and milk in a saucepan. Bring to a boil and boil for one minute, stirring constantly. Remove from heat and mix in cocoa, quick oatmeal and vanilla. Drop by spoonfuls on waxed paper. Chocolate oatmeal cookies that don't require oven time. I boil this for 6 minutes - I also use 5 tbsp cocoa. If it starts to get crumbly, stir in a teaspoon or two of hot water and they should set up fine. So Good, and ready in less than 15 minutes if you put the cookie sheet in the freezer. I would recommend spraying the wax paper with non stick spray before dropping the cookies on it. I used splenda instead of the sugar and they turned out great! 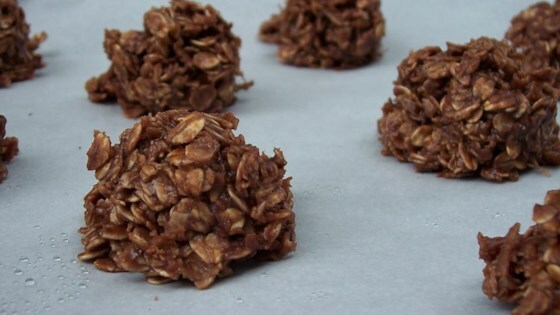 Great alternative to the no bakes with peanut butter. Very yummy.